Whale Shark Information : The biggest whale shark ever recorded was 12 metres (40 feet) long – although there are unreliable reports of an 18 metre (60 foot) whale shark. Despite being so huge, whale sharks are completely harmless to humans. Whale sharks are easily identified from their huge size, and from the pattern of dots that decorates their bodies. What do Whale Sharks Eat? Like all sharks, the Whale Shark 300 rows of tiny tiny teeth. However, it never uses its teeth to eat, since it eats only microscopic plankton, krill, algae, and other tiny tiny creatures that float into its wide-open mouth. When I say wide, I mean very wide! When it’s slurping up a gulp of krill, it opens up a 1.5 metre (5 foot) wide yawn. However, after that, the whale shark steps aside in the record books, to the world’s largest animal and vertebrate, the Blue Whale (which is a whale!). The Scientific Name for the Whale Shark is Rhincodon Typus. Rhincodon means “rasp tooth”, and Typus means “example”. That’s right, the whale shark is called “An Example of a Rhincodon”, being the only species of rhincodon in the world. Facts About Whale Sharks :The whale shark spends most of its time in the open seas. It often appears near the coast at those times of year when it expects to find lots of food there. It can smell its food and swims through the water where the concentration of food is highest. Baby whale sharks hatch out of eggs, but the eggs hatch before they are laid, so the mother shark gives birth to live baby sharks – 300 at a time! Diving with Whale Sharks : The whale shark is harmless to people, and a very slow swimmer. Its average speed is only about 5 kph (3 mph). Because of this, and because it is such a rare and beautiful (and huge!) 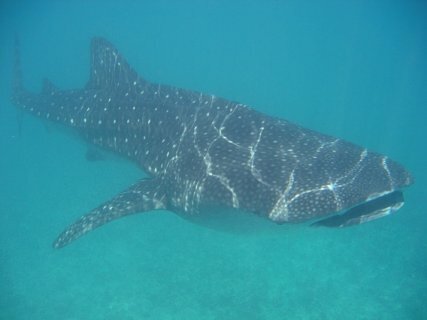 animal, diving with whale sharks is a popular attraction for experienced scuba divers and snorkelers. The shark is often seen in Thailand, the Maldives, the Red Sea, Western Australia (Ningaloo reef), Gladden Spit Marine Reserve in Belize, and at the Galapagos islands. They are regularly seen from December to May in the Philippines (Donsol). Lucky divers have also come across whale sharks in the Seychelles and in Puerto Rico. Between December and September, they are well known to swim along the bay of La Paz in the Mexican Baja California. The picture to the right shows how big the shark is compared with a typical scuba diver. Whale Shark photos and pictures : The best way to get a whole bunch of really nice whale shark pictures is to search google images. In particular, the Florida Museum of Natural History has a detailed description of the Whale Shark’s lifestyle, with many nice photos and diagrams to match. The record Whale Shark was 41.3ft long and weighed 15-21tons.